We call this Jap weed round here and is fast becoming a real nuisance. 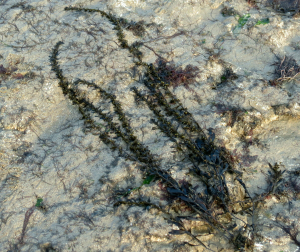 This was everywhere in this tidal pool and has virtually taken over the floor of the pool. Annual emptying of Thanet's largest tidal pool (at low tide end would be 5m) Found in eulittoral through to sublittoral, submerged probably most of the time here, when the sluice gates are shut. Would have liked to not post this really as there is such an amazing array of wildlife here.